various bits of London with friendly Abe the singing cab driver from Nigeria. It’s 1986. I’m trying to record some songs I’ve written. I go with my bestie Tamsin and my manager Freddie to back street recording studios that smell of booze and worse. There was no other option but to use a taxi - to places we simply had to visit. We sneaked out pounds from the money box for the gas bill and took ourselves off to Carnaby Street to visit the shop run by Boy George, hoping to impress. I was pink from head to toe, vintage before vintage was a thing, conjoined with a punk edging of black lace and Souxie Sioux eyeliner. On this particular day, the shop was, of course, shut. And nowadays? Last week I travelled to a work meeting on the Orange Line – an overground train for goodness sake! – which runs from near my home in Islington, to Stratford East, near the huge Westfield shopping mall and the Olympic stadia of 2012. 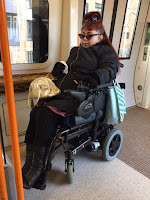 As a wheelchair user, I just turn up at the station. Someone immediately brings the ramp, at all points on this journey, from departure to return. Job done! My first train journeys were in the 2000s. There were accessible trains and buses before this but service and support was a haphazard. It’s all very well getting on a train but you do need a guarantee you can get off. And ramps on buses were often broken. But as I heard more about the experiences of friends who are wheelchair users, I started to explore. A London bus. What a thing to love. And hate. Ramps still play up and there’s a constant duelling with the driver, and the aggressive mother and buggy in the wheelchair space. My mum especially hates this, and regularly reminds me that no such space existed in her day. Pushchairs can fold, children be briefly carried. Wheelchair users generally cannot. Besides, it was disabled activists who fought for this facility back in the 90s. If angry mums joined with us, how powerful our lobbying would be. One of my most popular spoken word poems is called London Bus: On the busdouble decker, smelly bumpybonywrecker. I love them really. I’ve used a lot of public transport since, buses and trains, not only in London, but all over the UK. And in Amsterdam, Dublin and New York. This is a huge difference to the days of my memoir and those sparse journeys in cabs – and the occasional begging to the social worker for a – often creepy – voluntary driver to get me OUTSIDE PLEASE. It really felt like an extraordinary act of rebellion to be disabled and seen anywhere public back then. Especially in as a young woman in fishnets, zip skirts and with spiky hair. There’s still a lot of journeys to try out in 2018 and this summer I aim to do a day investigating the latest accessible tube routes. I’ll be there, ready with my iPhone, as excited as a big kid, and needing that photo of my next travel for Instagram.